OK, now that I’ve had 3 days to wallow in the excitement of moving to England, I have to come back to earth and get to work. And try not to think about what’s coming, because we can’t do a lot about it yet! I am working finishing up the glazing on 3 chinas this week. All solid colors because of MR. CRANKY, which is what I have named my air compressor. Here is a gorgeous bone china Optime, in solid glossy black!! This was one of those “weeeell, OK…” sort of commissions. Where I wasn’t sure that all-black was going to be all that amazing. 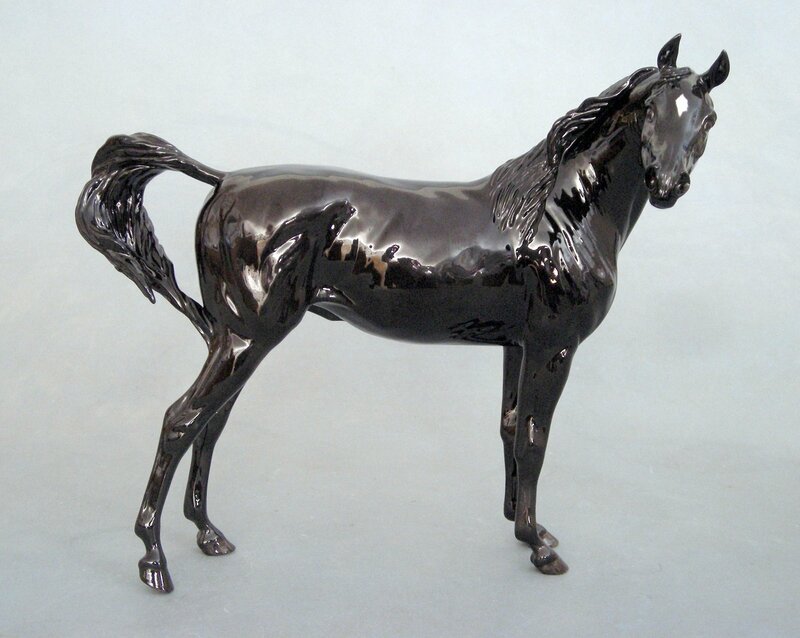 But WOW when I got him out of the kiln I couldn’t believe how much I loved the way this sculpture looks. Like it was carved in some sort of precious stone like ebony! This is the last bone china Optime I will be selling. 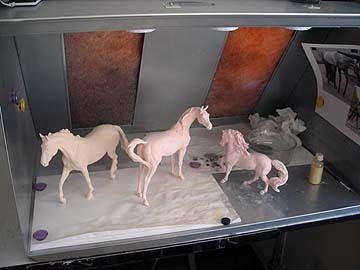 We are making the last 5 of them in earthenware (which are simply stunning by the way). 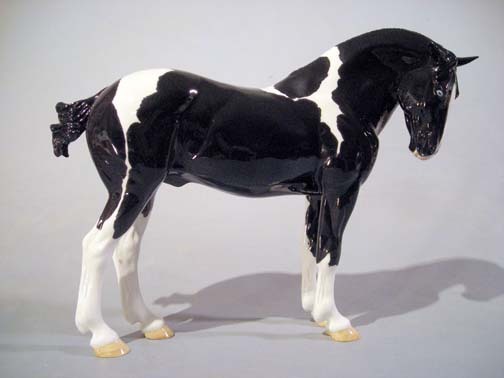 Next, I have a solid black tobiano Boreas. He has a blue eye. Another really splendid color ordered by a customer, that I thought I wouldn’t be all that excited about! Glazing chinas isn’t all gorgeous painting and beautiful finished pieces. It’s also a lot of unexciting prep work like spraying on the clear gloss glaze to bisques, so that I can then overglaze them. Here are three in the pretty-in-pink mode. The glaze is pink before firing! I am happy to report that I picked up MR. CRANKY from the shop today, and he is GOOD TO GO. FINALLY. And now I will be less cranky too, because I can get back on track with work! ! PreviousKaren and Paul’s Excellent Adventure!